In Florida, we enjoy our time in our beautiful, natural surroundings. With Triangle Pool’s pool cleaning service in Seminole, Clearwater, St Pete, and Palm Harbor, your pool will always be in optimum shape every time you take a plunge in your water oasis. Our pools provide us with recreational opportunities; we are able to enjoy with family and friends and hang out in the gorgeous Florida environment, or get in shape swimming laps or doing water aerobics. So, it’s important to make sure your water quality is always in the best possible condition. Our pools are a source of relaxation. When you come home after a hot commute, or when the kids need to burn off all that excess energy, nothing can take the edge off like a cool dip in your backyard pool. 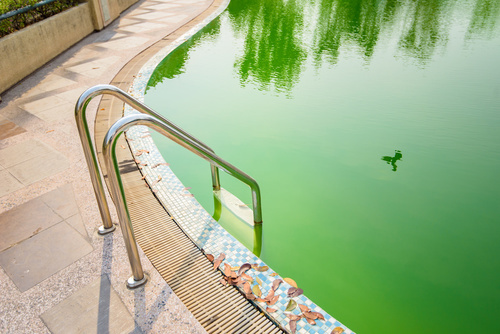 The flip side of this revivifying experience is that nothing can ruin the enjoyment of your pool like an algae bloom, or cloudy, murky, and discolored water – water you wouldn’t stick your toe into, much less entire body. Brushing the pool also helps the pool’s circulation. Good circulation prevents the deposit of algae on the walls of the pool. Each of these symptoms is an indication that something is out of whack in the chemical balance or sanitary state of the pool. Obtaining a pool cleaning service in Seminole, Clearwater, Palm Harbor, or St Pete is a sure way to confront and remedy these impediments to your enjoyment of your pool. Some pool problems are easily treatable. For example, if the water does become cloudy because of debris such as dead algae after the pool has been shocked, microscopic debris, or just plain dirt – a flocculent can be added to the water. This agent binds the debris together, and the coagulated debris is then vacuumed out of the pool. The walls of your pool can become stained due to low pH levels, too low total alkalinity levels, a too low calcium hardness level, high levels of dissolved solids, and high levels of metal. The decreased aesthetic appeal of the pool also creates a less desirable place to unwind and recreate. However, removing these stains can be an intensive procedure, involving acid washing, or even resurfacing. Proper maintenance and balancing the pool’s chemicals can help you avoid this unnecessary work. Our pool cleaning service in Seminole, Clearwater, Palm Harbor, St Pete and surrounding Florida areas will see to it that such a problem does not develop in the first place. It isn’t enough to rely on chlorine to battle these illness-causing microorganisms. For one thing, chlorine quickly breaks down in the presence of UV light and heat. Over-chlorination comes with its own health risks, and many bacteria and viruses have resistance to the effects of chlorine. Other chemical sanitizers such as silver and copper are effective anti-viral and bacterial agents. Proper pool cleaning service in Seminole makes sure that that a swimmer in your pool will never be exposed to a potentially deadly infection. Getting your pool on a weekly cleaning schedule is key in maintaining the water quality. If a problem does arise, Triangle Pool Service will be on the job to quickly nip any imbalance in the bud. We will work around your schedule so that you’re not inconvenienced. Triangle is licensed and insured (LIC # RP 0058712) and can do storm damage cleanup, insurance claims, special cleanups, and acid washing.